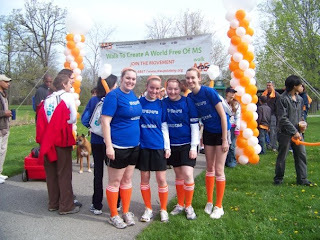 Side Dish of MS: MS walk! So today, my suitemates and I walked in the MS walk in our area. We had a blast. We had gone shopping yesterday to get our outfits all finalized and the pic shows us all decked out. So from the left to the right it goes, Hannah, Steph, Me aka Steph, Hannah. So we had on the shirts my mom got us that we got to design, our orange soccer socks and orange headbands. We had a few comments on our outfits and stuff and I think we stood out a bit, especially with our socks. kinda cool. We were a small team and it is always nice to be noticed. We even were the firsts ones tow alk through the start line at 10am. needed to remove my long sleeve tee shirt. Well... I tried really hard and I needed Steph to help me...it is really hard to get out of one shirt all while staying fully covered with the top layer. 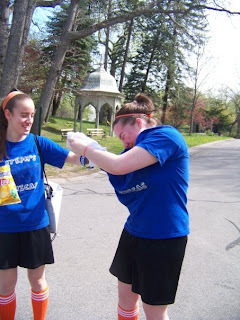 I am glad though it was not like a billion degrees because with the 60ish degree weather and some sun and the 5.5 miles, I had 10 swollen fingers and a nasty headache by the time we finished. I really thought I was going to die when we where going up one hill, my heart was beating so fast that it just seems like there was just back to back beating at 100mph. All in all though, we had a blast, and raised a ton of money...a whopping 845 dollars...to be exact!!! 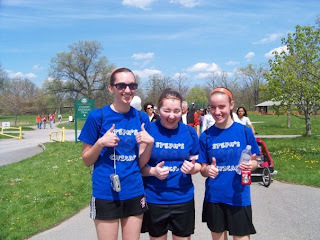 my face...I am such a pretty pretty picture poser...and it was at the finish line.